In the two weeks leading up to my daddy’s annual visit to Vancouver, I was pretty stressed out by work and life and non-existent preparations for his arrival. He would be in town for four days which is actually about a day longer than previous visits. It’s hard to remember back to when he didn’t visit annually but now he does but it’s not enough still. This post is largely for me to remember the visit, what we did, so we might do different things next time. Daddy arrived on Thursday around noon. His older brother did not have a car at his disposal and I hadn’t taken that day off work and thought it would be neat for Daddy to take the Canada Line from the airport (terminus station so you can’t possibly go in the wrong direction) to Vancouver City Centre where I work. I could meet him for a short bit and then put him on the correct bus to get to his mother’s. Whether he missed the bus stop or not was a slight concern. But his older brother would not let his 68-year-old younger brother take public transit so my dad’s sister-in-law cancelled an appointment she had so they could pick him up. 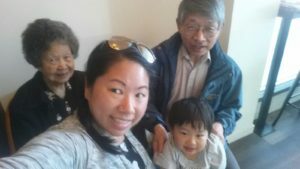 With his mother, older brother and sister-in-law, Daddy had dim sum lunch at Pelican. Apparently Pelican meets the Lock family stamp of approval and handily, it is close to my grandmother’s condo so no one has to go out of their way to pick her up or drop her off after meals. I met up with Daddy ASAP after work but it was late as I only got off work at 5:30, tying things up ahead of a long weekend. I would have liked to go to Happy Day in Burnaby but Ipoh is a similar style restaurant and much closer. We ordered a three side dish meal (curry beef brisket, an egg tofu dish with mushroom and broccoli, and gingery beef hot pot) and the complimentary food was soup, Hainanese chicken, and a Chinese dessert soup. The soup was delicious and my grandmother taught me about the particular herb used (冬蟲夏草 Ophiocordyceps sinensis fka Cordyceps sinensis) and what other herbs to use to make the soup we were tasting. 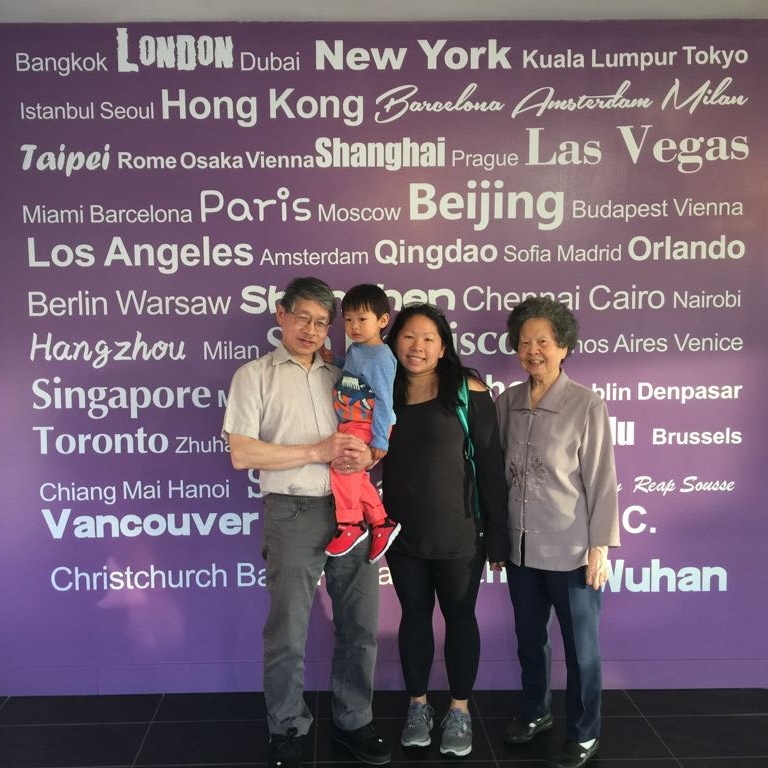 I’ve been to Ipoh so many times because it’s in the in-laws’ neighbourhood but it had never before been so loud in there – not so busy, and not with three completely wild children running around and playing in the restaurant. I took Friday off work and as early as possible, I picked up Daddy and my grandmother and we head to Lynn Canyon. I got hilariously lost because I navigated to Lynn Canyon Park when I should have navigated to the Lynn Canyon Ecology Centre where the main trailhead is. Grandma hung back particluarly since the regular access to the suspension bridge was closed and it was an uneven temporary path. 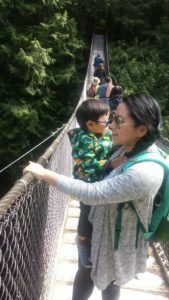 We only spent about 30 minutes in the forest but in that time we cross the bridge twice and E was game to walk himself on the return trip. After the first crossing, on the other side, we didn’t venture that far. E could have gone for longer but we turned us around to meet up with grandmother. 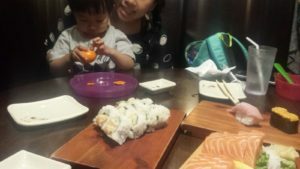 I would have preferred most to take them to our usual haunt, Sushi California, but E would nap after lunch and it was extra running around for me and my grandmother wouldn’t want to be stranded in my neighbourhood while E napped. They had been to Sushi Nanaimo (in grandmother’s neighbourhood) before so I took them to the North Vancouver location of Sushi Town. After sushi lunch, we popped into nearby JJ Bean for some coffee. E was so pooped from the outdoor adventure he fell asleep in the car on the way home after I dropped off Daddy and my grandmother. I felt like the morning alone made the day off worth it. For dinner on Friday, we were back at Pelican. Daddy’s younger brother and his sister-in-law came to dinner and it was fun to dish about raising kids since my aunt is really involved in raising her two grandchildren who are both younger than E.
Daddy stayed over at our place on Friday night and I was eager to show him what’s new since last year: our 65″ wall-mounted TV and E’s bed amongst other things. Last year, our visitors slept on the couches and I felt pretty bad about that. Saturday morning was packed with activities so it was crucial Daddy was nearby. Saturday morning was the much-anticipated Run for Women at UBC. I was anxious about all sorts of things – getting there in time, that everyone would enjoy it, my performance, etc. I had a super experience and was so pleased that Daddy got to spend some time in Wesbrook Village that is so nice, especially on a nice day. I arranged that NPY and Daddy could pick up coffee at Blenz (2 for 1!) before the race, and NPY figured out where to take E and Daddy to catch me at a couple of points during the out-and-back run. As soon as the race was over and I picked up all the goodies, we were headed back to Vancouver for E’s first Mandarin storytime class. As such, Daddy got to see the eye-popping beautiful Hillcrest Community Centre. Since it was approaching lunch time, I suggested NPY take my Daddy to lunch while we played. I would have liked Daddy to try Cafe Gloucester but Copa Cafe is closer and better value. Daddy has been to Copa Cafe before but … whatever! For dinner, we were back in East Van to pick up grandmother for dinner and I suggested getting Vietnamese food at Bao Chau. My grandmother “eats anything”, she says, but that doesn’t mean she will enjoy an Italian or Greek meal! Bao Chau was having some problems with its fire alarm – it kept going off – and it didn’t appear as if they were doing anything about it. It was ear-splitting, upsetting my grandmother and too loud for E’s young ears so we got up and left as we hadn’t yet ordered and walked a block east to Le Petit Saigon. I was instantly disappointed because it just wasn’t my first choice. In any case, we got through dinner and I considered a visit to Chatime reward for that. There is a Chatime location in Halifax but it’s not like Daddy would visit! So he got to try it with us. Saturday night, Daddy spent at his mother’s – she who wants him exclusively during his visit but I stake some claim. I keenly felt his absence after having him around for 24 hours. On Sunday, while we were pre-determined to attend a 100-day thing (on Mother’s Day! ), Daddy went to my grandmother’s church and after that, they had a big dim sum meal somewhere with his older brother, my cousin (his nephew) and my uncle’s in-laws, as we’re all friends. As soon as possible, I picked up Daddy from my grandmother’s and brought him to shopping at T&T followed by dropping in Cho’s to look for a vegetable Mummy wanted but isn’t quite in season yet. I felt a little hurried at the markets but never expressed it, letting Daddy linger over what caught his eye. It’s one of those things I really like doing when I visit family and friends in other cities because it’s about the most normal thing to do and we get to do it together. We swung by Chinatown to pick up some carb dishes from Kent’s Kitchen. While I made dinner, Daddy and E and NPY walked through the square to London Drugs. Even the mundane things matter to me. Daddy observed that I had never cooked for him before and that would be correct. The extent of my cooking on display was steaming rice and making delicious steamed egg & pork patty. After dinner, after observing E’s nightime routine (it changes every time and E was frightfully uncooperative while toothbrushing), I took Daddy to the airport ahead of his 11:15 pm red-eye flight. For me, there was a dreaminess to driving my father to the airport. Night had settled in and the air felt like summer such that it was warm and I had the sunroof open. The abundant trees in Vancouver were but a shadow and similar to Halifax but there are far more lights and cars everywhere. I wondered if it felt like a dream to my father, these four days away from the grind, in this city that had perfect weather for four days, all of us taking time out of our lives to be together. But there’s the realization that everyone is going back to their lives, that this blip of having my father in town would soon be just a memory. I think I find it kind of dreamy any time I’m driving at night and haven’t the responsibility of having the child in tow. Deliciously dreamy. On a somewhat related note, I was in East Van so much more than usual I wondered if I saw a ghost or actually someone from my past. Once, when we were returning from North Van and there was a shirtless guy running along Hastings toward the track he told me he frequents. The other time, after the T&T visit, on Broadway, a motorcyclist seemed to peer at me for longer than usual. That, or I was driving erratically and he wasn’t him and just a cautious motorcyclist around this wildcard driver. As a background, I have a huge amount of regret over a missed opportunity last December. E and I arrived in Halifax close to midnight and we head straight to Air Canada Luggage Services at the end of the Arrivals Hall because E had been paged. When we came out of the office, I spied my daddy and told E that his grandfather was coming and they ran towards each other until caught up in a hug. So sweet.